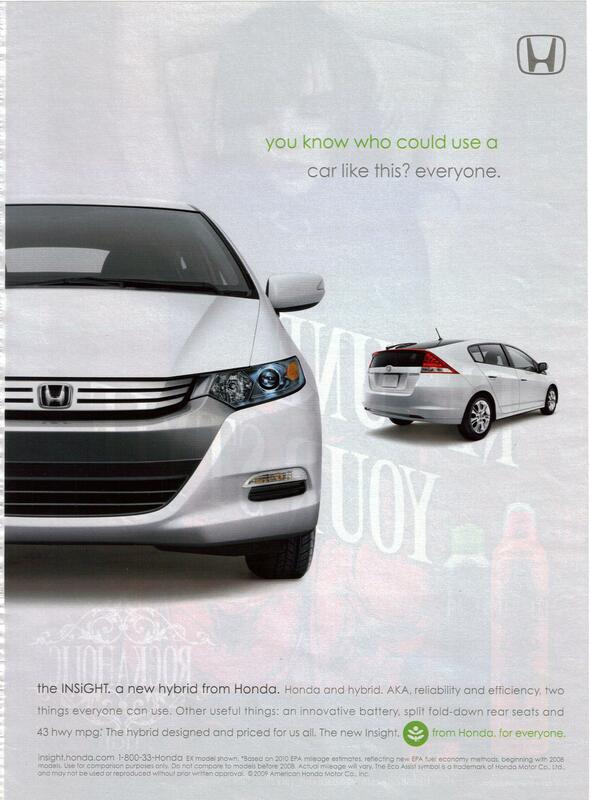 This is a magazine ad for the Honda Insight. You know who could use a car like this? Everyone. The Insight. A new hybrid from Honda. Honda and hybrid. AKA, reliability and efficiency, two thing everyone can use. Other useful things: an innovative battery, split fold-down rear seats and 43 hwy mpg. The hybrid designed and priced for us all. The new Insight. From Honda. For everyone. I’m not normally a big fan of car ads. I think that they generally try too hard and get too gimmicky. I like this one, though, because it doesn’t feel like it’s doing either of those things. It’s clean, simple and informative. It’s got a strong, confident opening statement, but since we all pretty much expect car ads to feel that way anyway, it’s not really a problem. The blurb at the bottom is a little light on information, but it focuses on the main strengths of the car – that it’s a hybrid and that it’s got Honda’s reliable record and reputation behind it. It also lists three features that are strong selling points and suggests that it’s reasonably priced. This ad is a little light on details, but since you’re going to be hearing about all those details when you go in to look at the car anyway (or could easily find them on the Honda website if you want more information), it’s not necessary to list every spec in the ad. It lists more useful information than many car ads I see. The mpg is way more useful to know than the fact that a car has a decorative light display. So I like this ad a lot. It’s simple, the basic color palette is enough to catch your eye, and it’s got just enough information to pique interest and encourage potential customers to learn more about it. This entry was posted on May 6, 2010 at 12:00 pm	and is filed under Cars. Tagged: honda, insight, print-ad. You can follow any responses to this entry through the RSS 2.0 feed. You can leave a response, or trackback from your own site.